In 2007 the study of migration routes of Greater Whitefronted Geese will be continued. Altogether 14 transmitters were launched in January and February 2007 in The Netherlands and can be followed live on web. Starting in 2006 a successfull first study was started. Three of five transmitters could be followed to Russia where two of them were shot. The third one send data up to mid of November when the PTT signal stopped in Poland. Up to this moment the bird migrated more than 13.000 km. Read more about this project. In the very northeast of Bulgaria close to the Black Sea several lakes and lagune are situated. Very close to this area where a lot of ground was bought to protect staging sites of Redbreasted Geese (Branta rufficollis) new dangerful plan exist: a set of windpower turbnis will be erected there. In to order to EU comission Wetlands International and EURING wrote a examination about waterfowl and risks of avian influenza in europe. This documents presents lots of data, informations and recoveries of migratory birds and can be free downloaded in the web. Here for more informations. 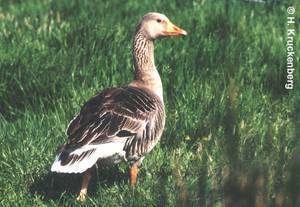 A Greylag goose which was colour-marked in the city of Hamburg in 2004 was seen at Altmühlsee bei Gunzenhausen (Bavaria) in summer 2006. The distance is 493km. On 6th of january Ko Veldkamp observed the yellow banded Greylag Goose D01 near Slochteren (Dollard, NL). This bird was ringed on 10th of September 1982 at Lake Gülpe, Brandenburg. So, it`s 24 years old, now. Oil polluted Whitefront (klick for enlarge). Dez. 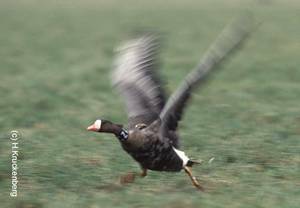 2005 More than 100 oiled Whitefronted geese were observed near the Dollard (Germany). The diesel oil run into the river while a ship sunk ("MS Eberswalde") in the Ems in the beginning of December, local bird experts suppose. More than a week diesel came out of the broken ship. The Dollard bay is part of nationalpark waddensea. The river Ems was implemented as a special protection area (SPA) of European bird directive. To read more, klick here. 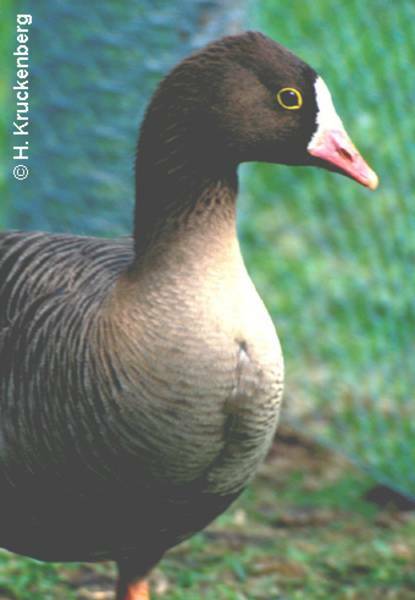 2005 Lesser Whitefronts (Anser erythropus) imaybe the threatened goose speices of the world. Less is known about their population size, wintering areas and migration routes. 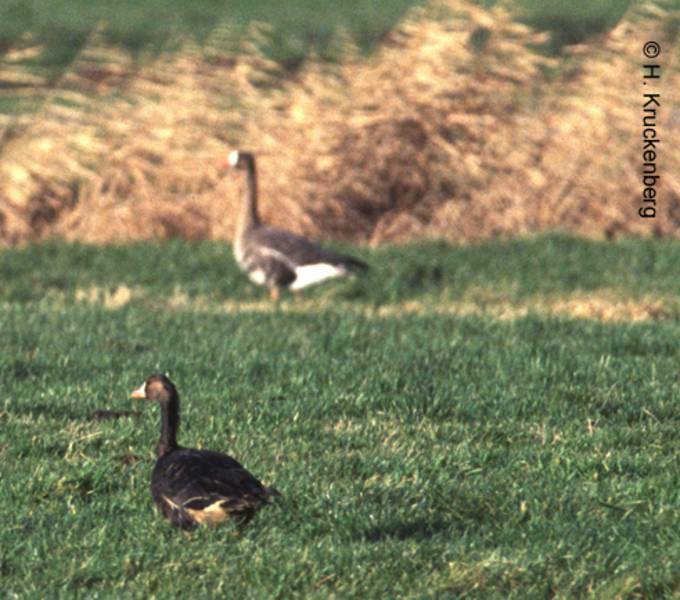 So, in summer 2004 Russian and Norwegian Goose Researchers fittet three Lesser Whitefronts with satellite transmitters. One bird was tracked the complete migration period. The bird migrated through Aserbaidsan to Iraq where is was wintering near Bagdad. In spring the bird went back and migrated to its breeding site back. To read more, klick here.